In latest version of Ubuntu i.e Lucid Lynx(Ubuntu 10.04),the canonical has added a video editor application/program in the default package.That default video editor is Pitivi Video Editor.In older versions of Ubuntu(Ubuntu 9.10 or other) OR If you want to try new video editing software then you should also try – OpenShot Video Editor.It’s free and in Linux Based distribution you can find it in software center or package manager. 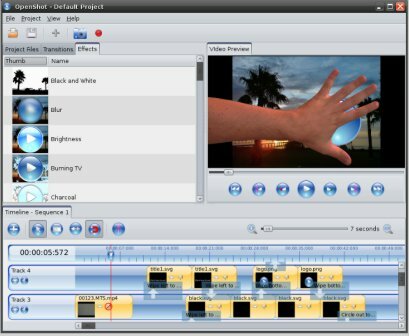 OpenShot is a free,open-source,non linear video editor.So you can use openshot to edit and create videos and movies in many popular video/audio/image file formats.Openshot uses MLT libraries for video editing(Also used by another popular Open source video editor Kdenlive). #1. Open Synaptic Package Manager and search for ‘openshot'(excluding quotes). #2. Then mark the box in the rows that says openshot,if you need help in editing videos then also mark openshot-doc for installation.Click ok if it says to install additional Libraries/dependencies. #3. Next,click on Apply to install the selected packages..and wait for the installation to complete. #4. Now,you can open it from Applications->Sound&Video->OpenShot. Conclusion : OpenShot video editor has a lot of new and exciting features(3d effects).Recently in a poll Openshot video editor has voted(35%) as the TOP open source video editor program.Enjoy Video editing with OpenShot,the best open video editor.